5. Do additives make tobacco more addictive? 5.1 How could additives affect addictiveness of tobacco products? 5.2 What does the evidence say about addictiveness of specific additives? 5.3 What does the evidence say about specific additives influence on nicotine addiction? Tobacco products are manipulated by tobacco companies by the addition of chemical compounds, most of which are flavours. Obviously, the flavours are added to the natural tobacco to give the product a better taste thereby increasing the attractiveness of these products. This includes the addition of humectants which keep the humidity of the tobacco product at a desired level; dry tobacco generates an unpleasant harsh smoke. “Light” cigarettes were introduced on the market in the 1970s. Typical for light cigarettes is their high grade of ventilation. Due to the delivery of less tar, the impact and taste of the “diluted” smoke is also decreased. It is therefore probable that the light cigarettes were “enriched” by adding more substances, and in higher amounts, to compensate for reduced taste and impact. In the following two sections, various approaches to increase the addictive and attractive potency of tobacco products have been briefly described. Détails of these additives and further information about their effectiveness can be found in later sections. Changing the physical properties of tobacco smoke, e.g. particle size. The five approaches are briefly described below. No examples of increasing the content of nicotine in tobacco are known. Moreover, in cigarettes sold (or produced) in the EU nicotine yield has to remain below a maximal level of 1 mg per cigarette. Some Member States also have upper limits for roll your own (RYO) tobacco. Genetic techniques or classical selection of variants are available to produce tobacco with relatively high nicotine content. From public sources it cannot be deduced or concluded that such approaches are indeed used by tobacco growers or tobacco companies. Increase the bioavailability of nicotine by adding alkalising ingredients which increase the pH of tobacco (such as ammonium compounds). At higher pH (pH >8.0) more nicotine is in its free uncharged form, which would therefore more easily pass the (lung) membrane i.e. higher absorption leading to higher blood and brain nicotine levels. For details see section 3.8.3.2 on ammonia and other compounds affecting smoke pH. Increase the bioavailability of nicotine by adding ingredients which serve as a carrier for nicotine. Increase the effect of nicotine by inhibiting its metabolism. Addition of substances which facilitate the inhalation of tobacco smoke Certain ingredients have local anaesthetic effects. As a result coughing due to inhalation of irritating smoke is dampened and the smoker can inhale the smoke deeper (and more frequently). Examples are etheric oils, such as menthol and thymol. For details see later sections e.g. section 3.8.1. Compounds which have bronchodilating properties (opening/broadening the airways) would enable the smoker to inhale deeper (a larger volume of) tobacco smoke implying an increase in the bioavailability of nicotine. It has been proposed that theobromine, generated from cocoa, caffeine and glycyrrhizine, serves such a function. It has been suggested that certain natural components in tobacco promote the addictiveness of nicotine. Examples are components like sugars, which when pyrolysed generate aldehydes. The combination of acetaldehyde and nicotine appears to be more addictive than nicotine alone. The addition of sugars may thus increase the addictive nature of tobacco products. In tobacco smoke or in vivo, tryptophan may react with aldehydes to form beta-carbolines, like harman and norharman. Both beta-carbolines are inhibitors of monoamine oxidases (MAO). Monoamine oxidases are enzymes that degrade neurotransmitters involved in addiction such as dopamine, serotonin and noradrenaline. As such, tryptophan as an ingredient may potentiate nicotine addiction. Acetaldehyde and other aldehydes can react in vivo with biogenic amines to yield carbolines or isoquinolines, which have affinity for the opiate receptor. These ligands are, however, formed in very low amounts. It is possible to change the physical properties of tobacco smoke, for example the particle size of the tobacco smoke aerosol. Considering the entry of particles to deeper lung levels, there is probably an optimum in size. Cigarette paper and/or filters can be modified in a technological way to attain an optimal particle size (see section 3.5). The size and its distribution of smoke particles can be changed to obtain an optimum so that particles enter deeper levels of the lungs. As a result, a more efficient absorption of nicotine from the particles and higher blood nicotine levels can be attained. Examples of such applications are the use of cigarette paper with a higher porosity and filters with higher ventilation (see section 3.5). Only few scientific articles have addressed the possibility that individual additives may cause addiction. It is probable that many additives have not been examined/analysed or the results (either positive or negative) have simply not been described in publicly available literature. In the peer-reviewed scientific articles assessed there is no documentation for certain individual additives to cause addiction directly. The following compounds, used as tobacco additives, may have an effect on the central nervous system: acetophenone, isoamyl alcohol, valerian oil, theobromine, and valerenic acid (Lington and Bevan 1994, Moreno 1978,, Oliva et al. 2004, Ortiz et al. 1999, Reynolds 1983a, Reynolds 1983b, Simons et al. 1985, Yuan et al. 2004). However, the fact that these additives may have an effect on the central nervous system (CNS) does not imply that they are addictive. Moreover, they are present in the products in very low amounts. Although several articles point out that some of the above mentioned additives may create dependence, it is probably more likely that they are acting by attractiveness, as they induce a more pleasant experience of smoking and therefore reduce the barrier in relation to smoking initiation. Additives which increase the absorption of nicotine or potentiate in whatever way the effect of nicotine on the nervous system implicitly increase the addictiveness of tobacco products. It has been proposed that the free nicotine content of smoke increases with increasing pH, which would lead to a higher uptake of nicotine in the bloodstream. A higher pH also increases the nicotine/tar ratio (Wayne and Carpenter 2009) as well as the harshness of the smoke (Hurt and Robertson 1998). The increased harshness will be disguised by using different additives that remove the smoker’s sensation of harshness. Ammonium salts are used as additives to increase the pH of tobacco. See Section 3.8.3.2 for a full description of ammonia technology. Because of its local anaesthetic properties, menthol allows a deeper inhalation of the irritating tobacco smoke. As such, more smoke could be inhaled and deeper puffs could be attained, resulting in a higher nicotine dose. See section 3.8.3.1 for detailed description of the action of menthol. Theobromine is found in cocoa beans; therefore this substance is present in cocoa and chocolate, both of which are used as additives in tobacco. Theobromine is a bronchodilator and has been used in the treatment of asthma (Simons et al. 1985). It has been proposed that the bronchodilating effect of the substance may contribute to the absorption of nicotine in connection with smoking (Bates et al. 1999, Fowles 2001). In a document from the New Zealand Ministry of Health (Fowles 2001) it is reported that up to 3% of the weight of cigarettes is cocoa extract and another 0.2% is chocolate. There is typically 0.2% theobromine in cocoa (Rambali et al. 2002). In most of the types of cigarettes containing cocoa and chocolate, which were reported to the Danish competent authorities12 in 2006, the contents of cocoa and chocolate are 0.3-0.5% and 0.2%, respectively. Based on the information available on the PMI and BAT websites the percentage of cocoa used in cigarettes ranges from 0.2% to 0.66%. Taking this information into account, the content of theobromine per cigarette will be too low to have a bronchodilating effect on the lungs and thereby increase the absorption of nicotine. Like theobromine, eucalyptol has an effect on the lungs as a bronchodilator (Hasani et al. 2003, Juergens et al. 2003). For eucalyptol it is also clear that the contents per cigarette are not large enough to exert this effect. However, even though the doses of theobromine and eucalyptol are so low in cigarettes that they probably do not have a bronchodilating effect, it cannot be excluded that there are other additives with a similar effect. The addictive effect of nicotine may be increased if the metabolism rate of nicotine is reduced. Reduction of the metabolic rate of nicotine, e.g. by inhibition of the metabolic enzymes involved in nicotine degradation, implicates a higher bioavailability of nicotine (nicotine is present in the body for a longer time or at a higher blood level). The additives gamma-heptalactone, gamma-valerolactone, gamma-decalactone, delta-decalactone, gamma-dodecalactone, delta-undecalactone and gamma-hexalactone are mild to weak inhibitors of CYP2A6, an enzyme within the P450 enzyme system, involved in the metabolism of nicotine (Juvonen et al. 2000). However, with IC50-values in the range 560-12,000 µM it seems unlikely that these compounds will inhibit nicotine metabolism at the amounts used in cigarettes. Sugar is already present naturally in considerable amounts in the tobacco leaf (up to 20%) and the quantities remaining in the final product depend on the curing methods. Sugar in different forms is also one of the most common additives in tobacco (see table 3 in section 3.8). When the sugars, including complex polysaccharides like cellulose (Seeman et al. 2002) in the tobacco product are combusted, various aldehydes are generated such as formaldehyde, acetaldehyde, propanal, 2-butenal, 2-methylpropenal, butanal, methylbutanal, furfural, benzaldehyde, methylfurfural, methoxybenzaldehyde (Adam et al. 2006, Baker et al. 2004b). Acetaldehyde is claimed to increase the addictiveness of nicotine in a synergistic way (Belluzzi et al. 2005, Charles et al. 1983, Philip Morris 1992). The mechanism of action may be that acetaldehyde forms secondary condensation products which inhibit monoamine oxidase (MAO). The inhibition of MAO by aldehydes has already been demonstrated many years ago (Townee 1964, Williams et al. 1992) and part of the inhibition is probably irreversible (Sowa et al. 2004, Wood et al. 2006). However, even during heavy smoking, only minor amounts of the acetaldehyde in the smoke is absorbed into the blood stream (McLaughlin et al. 1990), suggesting no direct addictive effect of sugars through acetaldehyde when used as a tobacco additive. Moreover, alcohol consumption leads, in contrast to smoking, to a significant increase in the acetaldehyde blood level by its metabolism. Acetaldehyde is very reactive and forms adducts with proteins and DNA. Chen et al. (2007b) found only a small contribution of chronic smoking to the formation of acetaldehyde DNA adducts, whereas alcohol consumption had a much higher effect, suggesting again that in chronic smokers lower amounts of acetaldehyde enter the circulation than in alcohol consumers. Acetaldehyde is rapidly oxidised in the body by dehydrogenases which, however, are much less efficient for oxidation of more complex aldehydes that are formed in the smoke by combustion of sugars. The decrease in the level of monoamine oxidases which has been repeatedly found in brains of smokers may thus be due to inhibition by aldehydes other than acetaldehyde which are present in the smoke. Finally, the addition of sugars to tobacco increases the content of acids in the smoke, resulting in a lowering of the pH value of the tobacco smoke. This may be one of the reasons why ammonia compounds are added to neutralise these acids. The sugars added to tobacco are mainly inverted sugar (fructose and glucose), and sucrose (Philip Morris 2002, Seeman et al. 2003), and are often added in the form of syrups (Covington & Burling 1992, Reynolds 1985). The main part of sugar substances in tobacco is non-volatile and only a small part is transferred unmodified into the mainstream smoke. The sugar substances are not hazardous to health by oral consumption, but are transformed to a number of toxic compounds under pyrolysis. These mainly include formaldehyde, acetaldehyde, acetone, acrolein, furans (Burton 1976) and different complex aldehydes . The pyrolysis products have a hazardous effect on health; formaldehyde is classified as a carcinogen to humans (IARC 2006, IARC 2009), whereas acetaldehyde and acrolein are highly irritating to the respiratory tract. Apart from the sugar substances mentioned, cellulose fibres are a natural part of the tobacco, and are also added as a binding agent (Baker et al. 2004b, Baker 2006, Fox 1993). Pyrolysis of cellulose fibres results in the formation of volatile aldehydes and levoglucosan (Seeman et al. 2002). The amount of pyrolysis products varies depending on the sugar contents and the temperature within the cigarette. It is difficult to estimate the relative contribution of pyrolysis products of simple sugars in relation to polysaccharides (Covington & Burling 1986). The pyrolysis products of polysaccharides and simple sugars are similar, but their yields differ (Fox 1993, Rodgman 2002, Sanders et al. 2003, Seeman et al. 2002). It is estimated that more formaldehyde and less acetaldehyde and acetone are generated from the pyrolysis of simple sugars compared to polysaccharides (Burton 1976). Animal studies have shown that acetaldehyde can maintain self-administration behaviour equal to, or probably more effectively than, nicotine (Charles et al. 1983, Philip Morris 1992). Belluzzi et al. (2005) found that acetaldehyde has reinforcing properties (Belluzzi et al. 2005). A number of studies have elaborated on the interaction between nicotine and acetaldehyde (Belluzzi et al. 2005, Cao et al. 2007, Charles et al. 1983, Philip Morris 1992). The combination of nicotine and acetaldehyde increases the degree of self-administration in young rats (Belluzzi et al. 2005). It is possible that norepinephrine contributes to the age-dependent difference in acetaldehyde uptake in rats (Sershen et al. 2009). A study by Cao et al. (2007) shows that acetaldehyde potentiates hyperlocomotive effects of nicotine in young as well as adult rats, but that these effects are more pronounced in adult rats. No effect of acetaldehyde on the nicotine level in the brain was observed (Cao et al. 2007). In the Philip Morris publications, the interaction between nicotine and acetaldehyde is examined with the purpose of increasing the reinforcing effect of tobacco (Charles et al. 1983, Philip Morris 1992). The synergistic interaction between nicotine and acetaldehyde is substantiated by experiments where the combination of nicotine and acetaldehyde results in a rewarding effect that exceeds the additive effects of each substance in rats (Philip Morris 1992). It is likely that the combination of nicotine plus acetaldehyde is more reinforcing than nicotine alone, as a long-lasting instrumental conditioned response in young rats was observed (maintains lever pressing at a higher rate than nicotine alone) (Charles et al. 1983, Philip Morris 1992). However, the effect of acetaldehyde seems not to be mediated by opioid receptors in the CNS and the substance does not cause physiological addictiveness (Charles et al. 1983). Cao et al. (2007) discussed whether acetaldehyde may pass the blood-brain barrier and directly affect the CNS. It is proposed that acetaldehyde has to be present in high concentrations (>100 µM) in the blood to overcome aldehyde dehydrogenase in the blood-brain barrier (Tabakoff et al. 1976). It should be noted that the experiments in animals used intravenous infusion of acetaldehyde, and as mentioned before, it is uncertain whether the acetaldehyde in smoke contributes significantly to the blood level of this substance (Chen et al. 2007b, McLaughlin et al. 1990). However, acetaldehyde is definitely not the only aldehyde produced by burning of sugars. Because the chemical aldehyde group has a potent inhibiting effect on monoamine oxidase activity (Townee 1964, Williams et al. 1992, Wood et al. 2006), it is suggested that those aldehydes which are more complex than acetaldehyde are responsible for monoamine oxidase inhibition and increased addictiveness of tobacco. The reinforcing effect of acetaldehyde may be due to the reaction between acetaldehyde and catecholamines, which results in the formation of tetraquinolines (beta-carboline and tetrahydroquinoline) (DeNoble 1994, Philip Morris 1992, Rahwan 1975). Tetraquinoline derivatives may act as false neurotransmitters and therefore promote addictiveness of the product (DeNoble 1994, Rahwan 1975). Others argue that acetaldehyde has an addictive effect because of the formation of the condensation products harman and norharman, which inhibit the enzyme monoamine oxidase (MAO). Inhibition of MAO results in a slower metabolism of the biogenic amines, like dopamine, noradrenaline and serotonin in the brain, so that the brain levels are increased by MAO-inhibition. However, it is only proven that harman could have significance for tobacco addiction by virtue of its inhibitory effect on MAO-A (Guillem et al. 2006). Indeed, harman is formed in the smoke (0.1 to 5.8 microgram per cigarette). At this level, harman, following its absorption, may be responsible for 3 to 11% of the inhibition of MAO-A (note that drinking a cup of coffee delivers 1 to 8 microgram orally). Nevertheless, whatever the active product, one smoked cigarette decreases MAO in the monkey heart by 25% (Valette et al. 2005). Smokers have decreased MAO-A and MAO-B activities in brain (Fowler et al. 1996), which recover following smoking cessation. However, harman and norharman are not irreversible inhibitors of monoamine oxidases and it has been shown that only an irreversible blockade of MAO-A and MAO-B increases the reinforcing effects of nicotine (Guillem et al. 2005; Villégier et al. 2006a). This suggests that aldehydes, which are probably irreversible inhibitors of monoamine oxidases (Sowa et al. 2004, Wood et al. 2006), could be the inhibitors of monoamine oxidases responsible for the increased reinforcing effects of nicotine in tobacco and tobacco smoke. Acetaldehyde is rapidly inactivated in the body. Therefore, more complex aldehydes are possible candidates for the observed monoamine oxidase inhibition. In summary, the mechanistic explanation for the role of sugars in smoking addiction is still unclear. Nicotine plasma levels are associated with cigarette smoking behaviour and nicotine is considered the main factor driving cigarette addiction. In apparent contradiction to this observation, nicotine replacement therapy, as a smoking cessation treatment, does not show the expected effectiveness. Therefore, it has been assumed that non-nicotine components are important in smoking reinforcement. The exact nature of these factors (chemical composition) is largely unknown, but constituents which provide reinforcing sensory stimulation and/or minimize excessive irritation from inhaled nicotine are considered to play an important role in non-nicotine effects in cigarette smoke (Rose 2006). In this chapter several studies with denicotinised cigarettes are briefly described to highlight the importance of the non-nicotine components in tobacco. Denicotinised cigarettes have the appearance, draw and taste of standard cigarettes but contain (and deliver) virtually no nicotine (<0.06 mg). However, they deliver tar and carbon monoxide (CO) in a comparable way to traditional cigarettes (Pickworth et al. 1999). In short term (for a few hours; maximum up to 24 hours) experiments, smoking volunteers were placed under tobacco (nicotine) abstinence and were allowed to smoke denicotinised or conventional cigarettes. In 1999, Pickworth et al. reported that the denicotinised cigarettes did not increase heart rate or activate the EEG, but subjects reported that both conventional and denicotinised cigarettes reduced (subjective) measures of tobacco craving and withdrawal (Pickworth et al. 1999). In a study by Eid et al. (2005) a stimulating effect on heart rate of denicotinised cigarettes was reported. Smoking of either denicotinised or conventional cigarettes caused a significant reduction in the craving score. The authors could not find a correlation between the nicotine yield and behavioural effects. Perkins et al. (2010) simulated different stressful situations (negative affects) during smoking abstinence and studied how relief was perceived after smoking. The authors did not find an association between the relief of several negative affects and smoking (also not from denicotinised cigarettes) but the relief was not dependent on nicotine intake, therefore, challenging the assumption that nicotine in smoking alleviates negative affects. Brody et al. (2009) found that, compared to conventional cigarettes, smoking denicotinised cigarettes (0.05 mg nicotine) resulted in a decrease in occupancy of the brain nicotine acetylcholine receptor (nAChR), as predicted on the basis of nicotine concentration. They did not observe occupancy of the nAChR with other factors, suggesting that only nicotine in cigarette smoke is capable of binding this receptor (Brody et al. 2009). These acute studies show that denicotinised cigarettes, compared to conventional cigarettes, do not exert the same pharmacological effects, but cravings and symptoms of withdrawal can be diminished and this phenomenon is, in many cases, independent of the delivered nicotine. Some components of tobacco smoke, other than nicotine, may be biologically active; thus it has been suggested that non-nicotine components of tobacco smoke decrease brain levels of monoamine oxidase A and B which possibly change sensitivity to the actions of nicotine and/or exert independent behavioural effects (Eid et al. 2005). Recently, Rose et al. (2010b) found that denicotinised smoke was self-administered more than any other alternative (i.v. nicotine self-administration or sham puffs) in established smokers, even after a few days of nicotine abstinence. This preference for denicotinised smoke compared to i.v. nicotine was inversely correlated with subjective ratings of “comfort” (normally) associated with nicotine; therefore non-nicotine aspects of cigarette smoking have potent reinforcing effects in established smokers. These authors, therefore suggested that in contrast to current smoking cessation pharmaco-therapies, which address only the nicotine component of nicotine (tobacco) addiction, future cessation strategies should also be designed to target non-nicotine factors such as added flavour constituents (e.g. menthol). In conclusion, besides nicotine, a mixture of other factors in cigarette smoke probably plays an important role in craving and reinforcement. Although these unknown factors do not have pharmacological effects similar to nicotine and are probably not addictive, they definitely play a role in smoking behaviour. Armitage et al. (2004) described a study in which 10 volunteers smoked either control cigarettes, cigarettes with diammonium hydrogen phosphate (DAP) or cigarettes with urea added. The venous blood levels of nicotine were independent of the amount of DAP or urea added to the tobacco. Preliminary data of a human study performed by a governmental research group at the RIVM (van Amsterdam et al., submitted for publication), comparing two commercial brands (one with low and one with high ammonia content) with respect to nicotine absorption, showed no difference in venous blood nicotine levels (no difference in total absorption and peak plasma of nicotine) when smoking the two brands. These findings are in agreement with data of Labstat test laboratory (Rickert 1997) clearly showing that the amount of ammonia in tobacco does not lead to higher yields of nicotine and ammonia in mainstream smoke or a higher smoke pH of 10 commercial products. Furthermore, in a review of Seeman (2007), it is concluded that the fraction of free base nicotine trapped in aged smoke particulate matter has not been shown to be a useful predictor of the amount or total rate of nicotine absorption by smokers. The bioavailability of nicotine is dependent upon the pH as only uncharged nicotine is volatile and can be absorbed readily across cell membranes. The different ways of manipulating cigarettes so that more free nicotine is delivered have recently been reviewed (Wayne and Carpenter 2009). At lower pH the nicotine molecule will be positively charged and an equilibrium between the three forms of nicotine is created in relation to the pH (see figure 3). 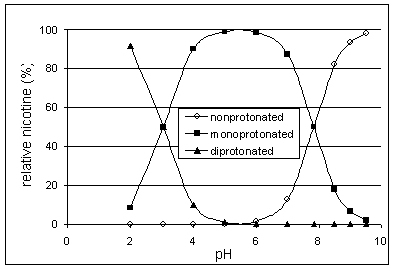 Figure 2:	Chemical form of nicotine (charged or free base) and their percentages as function of pH, ranging from 2 to 9.5 (adapted from Hoffmann and Hoffmann (1997)). Initially, cigarette smoke is lightly acidic and the nicotine is therefore poorly absorbed. However, the pH value is higher in the lungs (7.4) and some of the nicotine is found in uncharged form. Internal documents from the tobacco industry show that manufacturers started to use ammonia to increase smoke pH levels in the early 1970s (Willems et al. 2006). Particular focus has been on ammonia and related compounds, but any compound that contributes to increasing the pH value will have a potential effect in increasing the impact of nicotine and the rate at which inhaled nicotine is absorbed into the bloodstream. While it has been shown that the absorption of nicotine in smokeless tobacco by the oral mucosa is dependent on the pH of the product (Fant et al. 1999), it is uncertain if the pH in cigarette smoke has a significant impact on the nicotine absorption in the lungs. This is due to the high local buffering capacity of the lung lining fluid which will cause free nicotine to be charged (protonated) again in the deeper airways (Willems et al. 2006). The high buffering capacity of mucus has been shown experimentally in human volunteers (Holma and Hegg 1989). It is widely accepted that smoke from different pyrolysed tobacco delivery devices (e.g. cigarettes, cigars, waterpipes, etc.) is inhaled differently. For example, cigarette and waterpipe smoke tends to be inhaled into the lungs, while cigar smoke is typically only inhaled into the mouth (except among former cigarette smokers who have switched to cigar smoking, in which case they often smoke cigars like cigarettes). It has been argued that this may be due to the characteristics of both the delivery device (for example, waterpipes cool the tobacco smoke, thereby allowing easier, deeper inhalation) and the tobacco itself. Waterpipe smoking is associated with greater smoke exposure (a larger volume of smoke is inhaled) than cigarette smoking (Maziak et al. 2009). This difference in inhalation may be due in part to the more acidic pH of cigarette smoke. The smoke of most cigars has an alkaline pH; as a result, nicotine contained in the smoke can be readily absorbed across the oral mucosa without inhalation into the lung. The more acidic pH cigarette smoke produces a protonated form of nicotine which is much less readily absorbed by the oral mucosa, and the larger absorptive surface of the lung is required for the smoker to receive the desired dose of nicotine. According to the National Cancer Institute (NCI), cigarette smokers must inhale to ingest substantial quantities of nicotine (the active agent in smoke), whereas cigar smokers can ingest substantial quantities of nicotine without inhaling (NCI 1998). The difference may, however, also be explained by the fact that cigar smoke is more concentrated and contains much more nicotine than cigarette smoke. While there has been considerable research into the effects of product characteristics on cigarette smoking behaviour (such as ventilation holes in “light” cigarettes resulting in compensatory smoking whereby smoke is inhaled more deeply to extract the required dose of nicotine), there is relatively little research into the effects of other delivery devices such as waterpipes. This is despite the rapid growth in the popularity of waterpipe smoking in European countries in recent years. Certain tobacco additives may affect the central nervous system in smokers directly, but their concentration in tobacco products is probably too low to have a physiological effect. However, an indirect addictive effect of certain substances cannot be excluded. Some additives increase the pH of the smoke, thereby increasing the quantity of nicotine delivered to the smoker. Sugars generate aldehydes such as acetaldehyde during combustion. When given intravenously to animals, acetaldehyde potentiates the addictive effect of nicotine. The mechanism of action of the reinforcing effect of acetaldehyde in animals is not clear, although an inhibition of MAO is the most likely reason. Inhibition of MAO has also been observed in human smokers. However, acetaldehyde, generated from the sugars during combustion, is presumably not absorbed into the blood stream, and this suggests that other aldehydes, produced by sugar combustion are responsible for the inhibition of monoamine oxidases and the increased addictiveness of tobacco products. Natural tobacco already contains considerable amounts of sugars, especially Virginia tobacco. In addition, polysaccharides and cellulose fibres in the tobacco leaves generate acetaldehyde and other aldehydes upon combustion. In this respect addition of sugars to tobacco may lead to a significant increase in the addictiveness of the product. Les droits d’auteur de la Structure à Trois Niveaux utilisée pour communiquer cet avis du SCHER appartiennent à Cogeneris SPRL.